It appears that Vice President Al Gore won't be moving to 1600 Pennsylvania Avenue anytime soon, but he can take solace in the fact that the office of Vice President is historically not the best stepping stone to election to the White House. While 14 vice presidents have gone on to serve as the chief executive, nine of those were due to death or resignation. 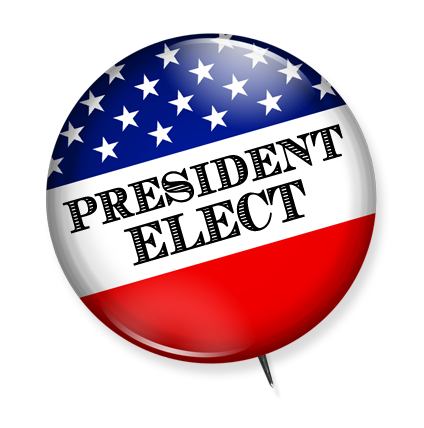 Only four men have been elected president immediately following their terms as vice president - and three of those were before 1840! Gore might want to keep his hopes up reading about another sitting veep who after losing an extremely close election was able to come back several years later and win the presidency. But for now he'll have to buck up and resign himself to joining the other two vice presidents who, after presiding over the counting of electoral votes in Congress, had to declare their opponent the winner. under George Washington elected President over Jefferson. served one term from 1797-1801.
under John Adams elected President over his boss, Adams, and running mate Aaron Burr. served two terms from 1801-1809.
and James Madison defeated by James Madison in 1808 (Clinton was running as a candidate for president against Madison, even though he had been nominated as Madison's VP). Clinton purposely avoided being in Washington for the counting of electoral votes, and therefore did not declare his opponent the winner or himself the re-elected VP. under Andrew Jackson elected President over William Henry Harrison. served one term from 1837-1841. no other sitting VP would be elected president for almost 150 years. under William Henry Harrison succeeded to the presidency after the death of Harrison. served from 1841-1845.
under Zachary Taylor succeeded to the presidency after the death of Taylor. served from 1850-1853.
under James Buchanan defeated by Abraham Lincoln. presided over the counting of electoral votes in Congress and had to declare his opponent the winner. under Abraham Lincoln succeeded to the presidency after the assassination of Lincoln. served from 1865-1869.
under James Garfield succeeded to the presidency after the assassination of Garfield. served from 1881-1885.
under William McKinley succeeded to the presidency after the assassination of McKinley. elected for an additional term. served from 1901-1909. defeated by Woodrow Wilson in 1912.
under Warren Harding succeeded to the presidency after the death of Harding. elected for an additional term. served from 1923-1929.
under Franklin Roosevelt defeated by Harry Truman in 1948.
under Franklin Roosevelt succeeded to the presidency after the death of Roosevelt. elected for an additional term. served from 1945-1953.
under Dwight Eisenhower defeated by John Kennedy. presided over the counting of electoral votes in Congress and had to declare his opponent the winner. elected President over Humphrey in 1968. served one full term/one partial term from 1969-1974.
under John Kennedy succeeded to the presidency after the assassination of Kennedy. elected for an additional term. served from 1963-1969.
under Lyndon Johnson defeated by Nixon. was out of the country and did not preside over the counting of electoral votes in Congress. under Richard Nixon succeeded to the presidency after the resignation of Nixon. served from 1974-1977.
under Jimmy Carter defeated by Ronald Reagan in 1984.
under Ronald Reagan elected President over Michael Dukakis. served one term from 1989-1993. first sitting VP elected president in almost 150 years. under Bill Clinton defeated by George W. Bush. presided over the counting of electoral votes in Congress and had to declare his opponent the winner.